Style is a strange quality. Some people strive hard in an attempt to develop it, others just possess it without even trying. The hardest thing of all however is taking that style and injecting it into the things you create and the ideas you come up with. It’s not easy getting recognition, but Miura-san at TRA Kyoto has done just that in a very short amount of time. 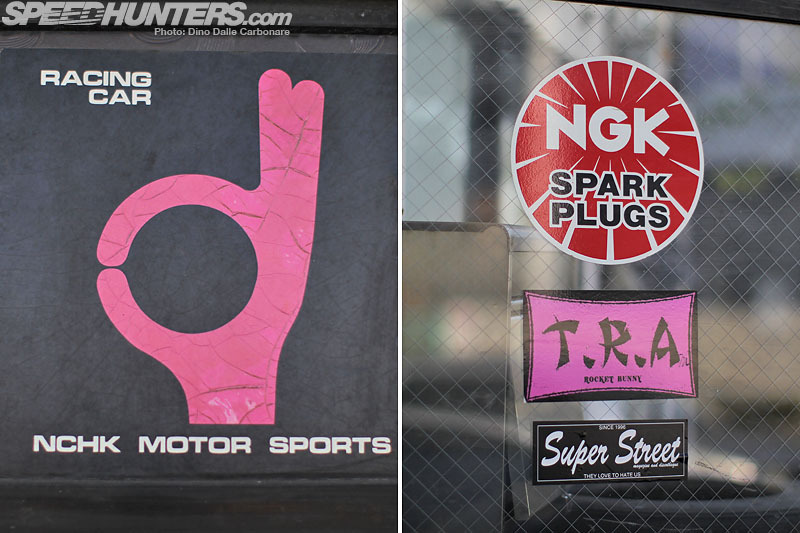 While Rocket Bunny seems to be on everyone’s lips right now, I thought I’d dig a little deeper and bring you an inside look at what makes Miura and his brands revered the world over. And there is so much more than first meets the eye. 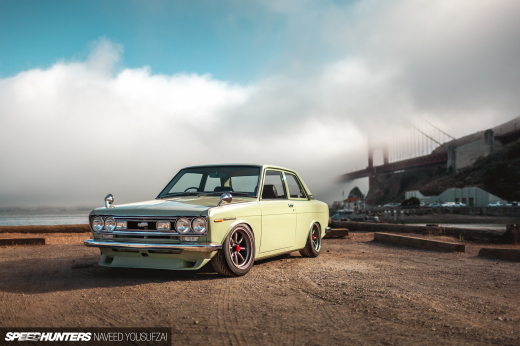 Despite having gained international fame over the last few years, not many people quite understand what Miura has brought to the JDM tuning world. 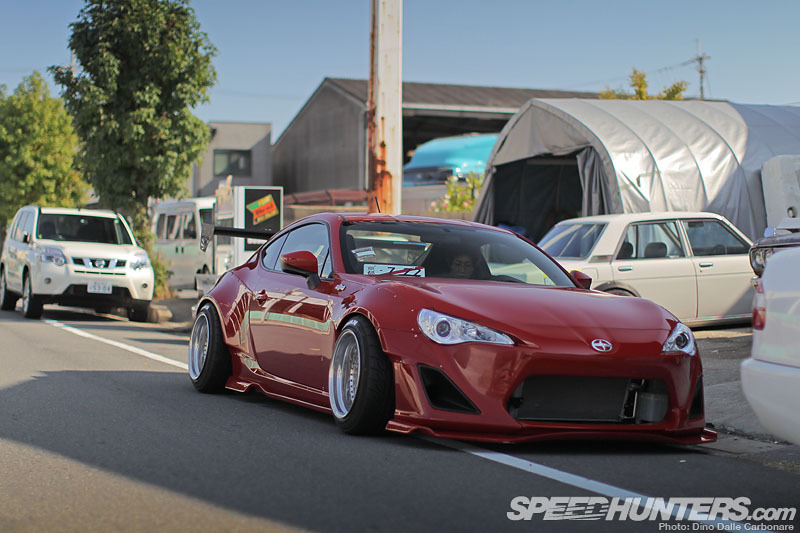 On the face of it he runs TRA Kyoto and makes those cool Rocket Bunny aero pieces that everyone wants for their 86s, FR-Ss and BRZs, but it’s the way in which he goes about it that sets him apart. However, before I get into that, let’s spend some time and take a quick look at the shop itself, which is located in the outskirts of Kyoto. … you probably wouldn’t even know it existed. 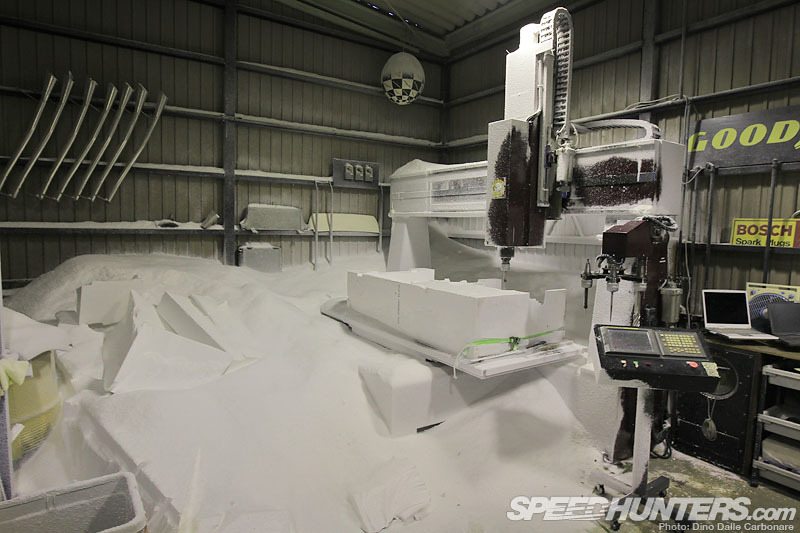 There are no flashy signs telling you this is ‘Tops Racing Arts Kyoto’ – just a bunch of stacked parts, cars and lots of curious looking rectangular pieces of polystyrene foam. Miura’s daily driver is usually parked right up front and half sticking out onto the street that runs across this particular busy industrial estate. … as well as a few simple decals. This was actually the first car that Miura prepared for the Tokyo Auto Salon back in the late ’90s, around eight or so years after he started the business. The Nissan has been sitting outside the shop ever since. Looking around you begin to get a sense of what this shop specializes in. 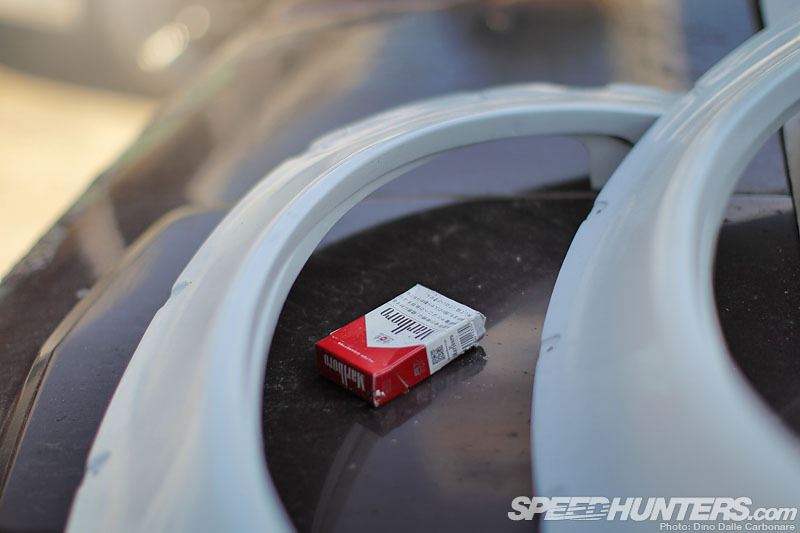 Prototype FRP overfenders and other bits and pieces can be found everywhere, along with half-empty Marlboro packets. 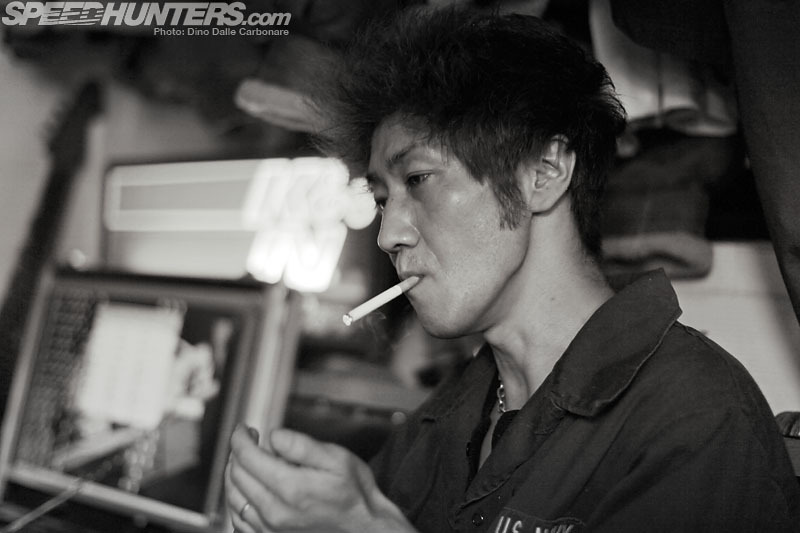 Whenever Miura needs a cigarette he is never too far from his fix. 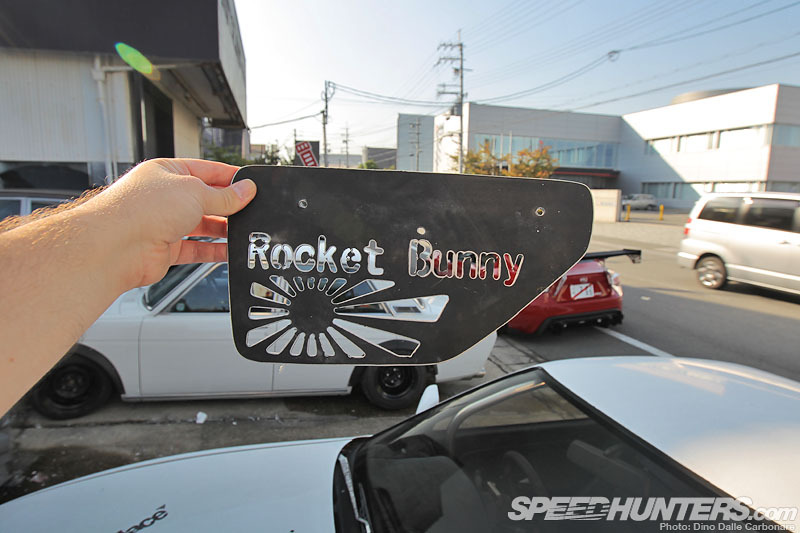 With the 86 ‘Rocket Bunny’ kit having become so well received, a lot of people often refer to the company with this name, but that is of course not actually correct. 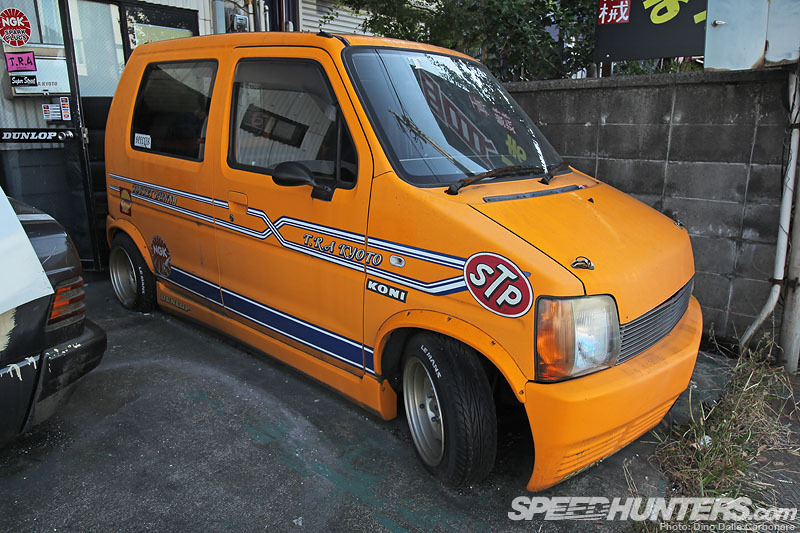 Rocket Bunny is just a line up of parts that Miura developed back in the day, and originally for kei vans like this Suzuki Wagon R – another one of his old demo cars/daily drivers. 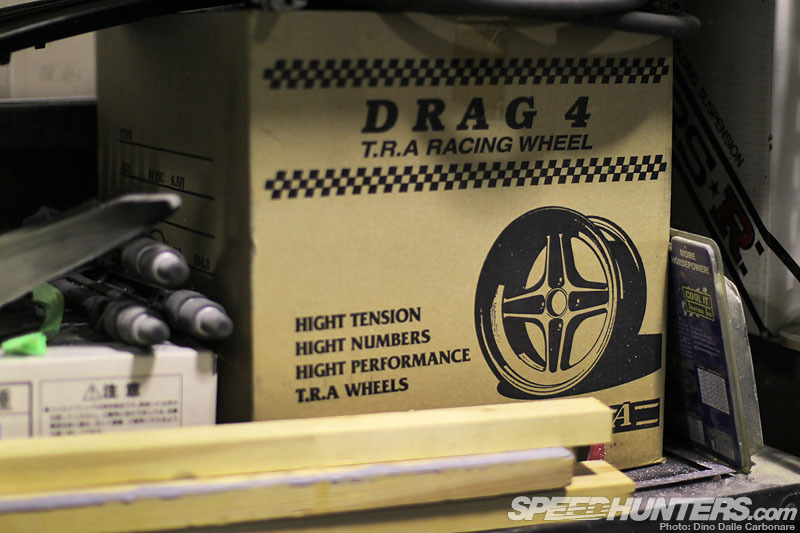 After Rocket Bunny, 6666 Customs (four-six Customs) – an aggressive aero line – arrived on the scene with cool overfenders for cars like the S13, RPS13 and S14, Miura really begun to be noticed at events like TAS. 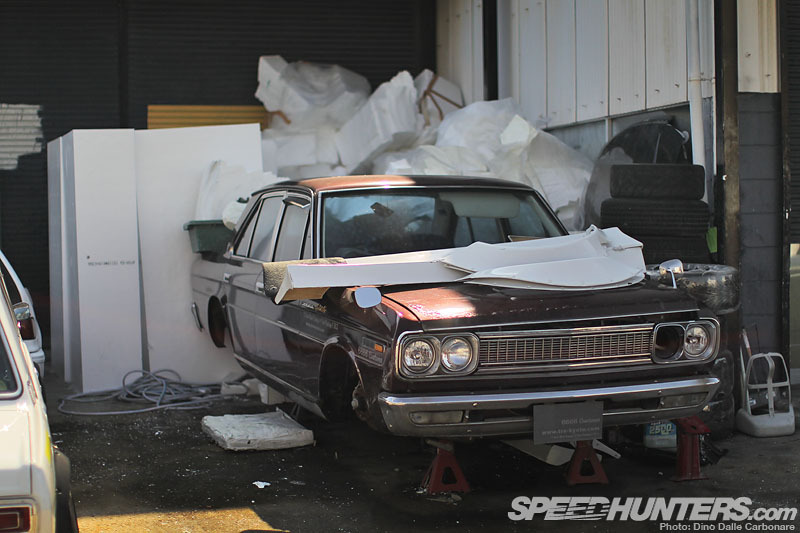 On the subject of abandoned-looking rides, right up in front of the main’s workshop shutter was the 6666 Customs-kitted Kanjo Racer – a car I photographed a long time ago on one of my first visits to TRA Kyoto. It was kind of sad seeing the EF Honda Civic looking the way it did, but Miura does have plans to fix it up eventually. 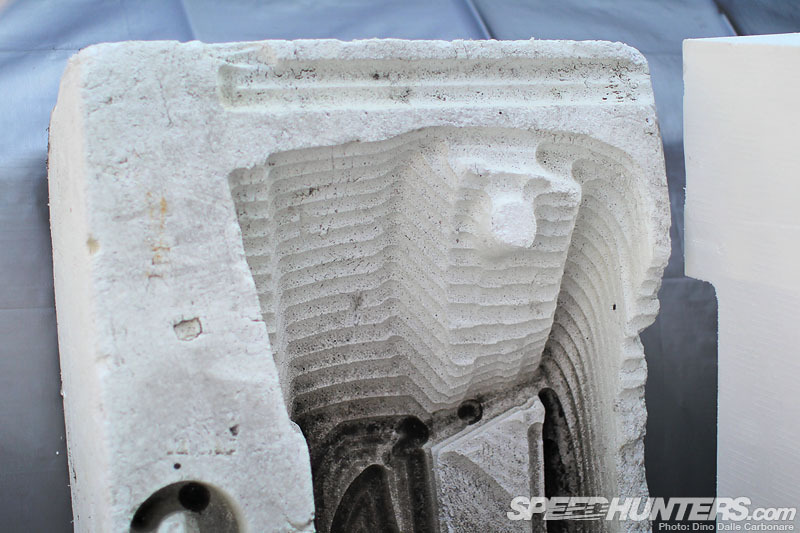 When you see a large number of similarly-machined polystyrene pieces like these lying around you can’t but help get curious. But before heading inside the shop there was still more I wanted to look at. 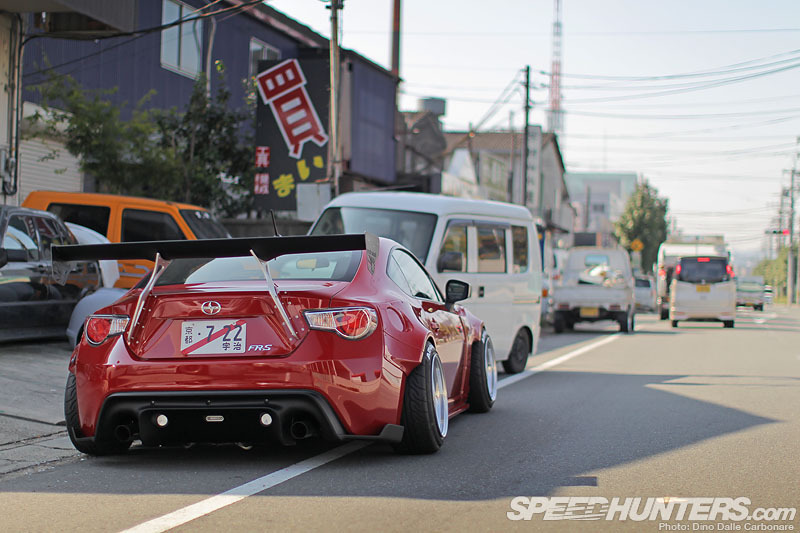 Seeing the popularity and knowing his design ethos behind the Rocket Bunny name, Miura decided to use it for the 86. Speaking of which, check out what I spotted discarded in a trash can outside. 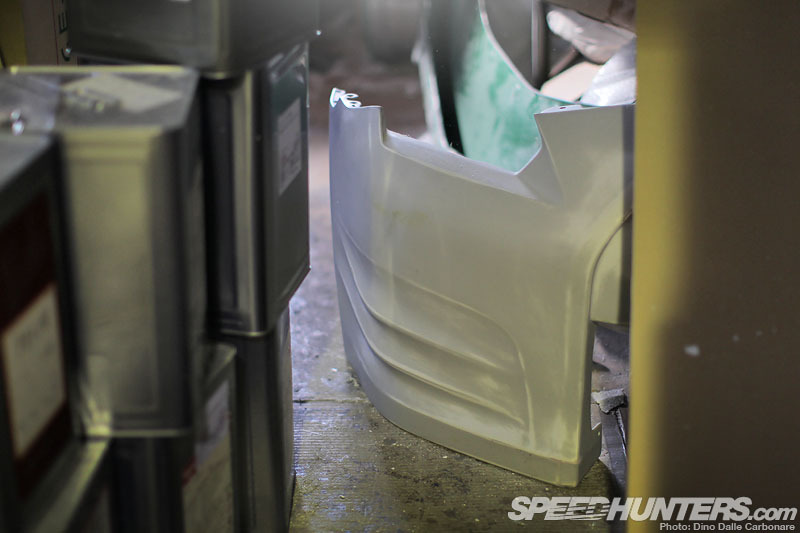 This is one of the prototype end caps for the 86 rear wing – something so cool I couldn’t possibly leave it there. I asked Miura-san if I could grab it and on top of saying yes he even signed it for me. It’s now hanging on the wall of my office! 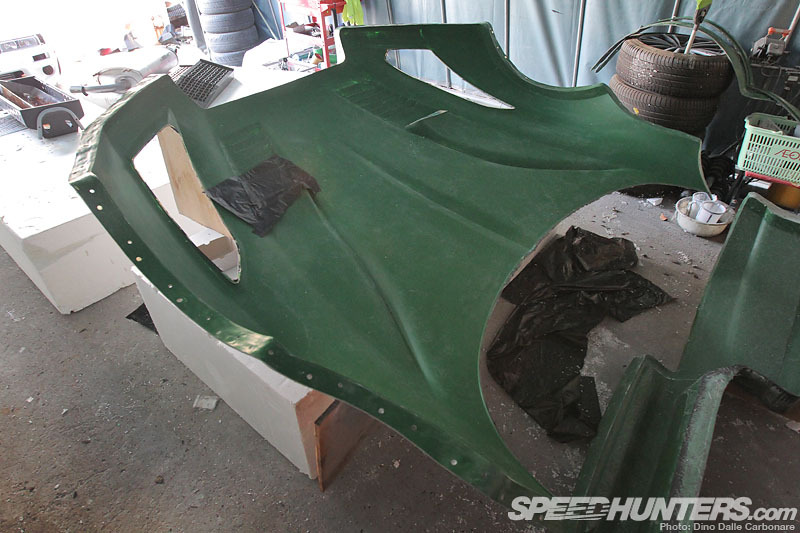 Under the canopy next to the parked cars I spotted the master mould to a very famous aero kit. Can anyone guess what this is? Miura has always felt a lot of inspiration from old school and classic designs, so he surrounds himself with a wide variety of retro items. 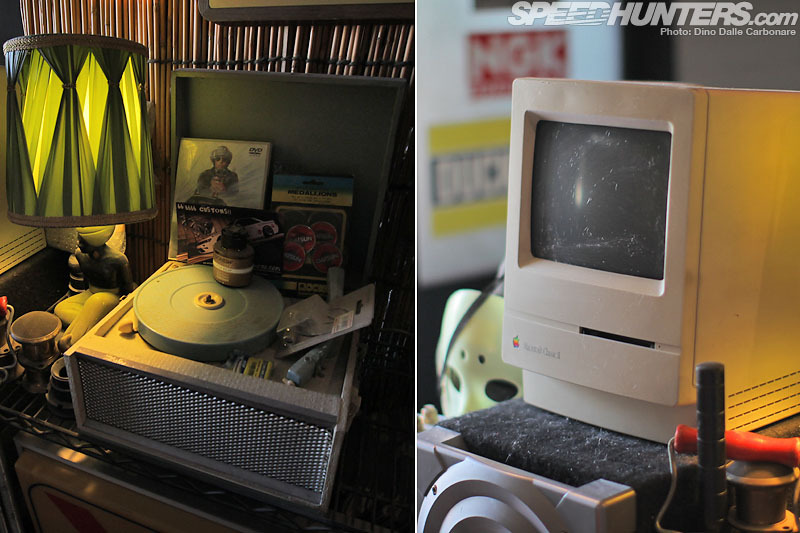 … that you realize just how much stuff he has accumulated over the years. 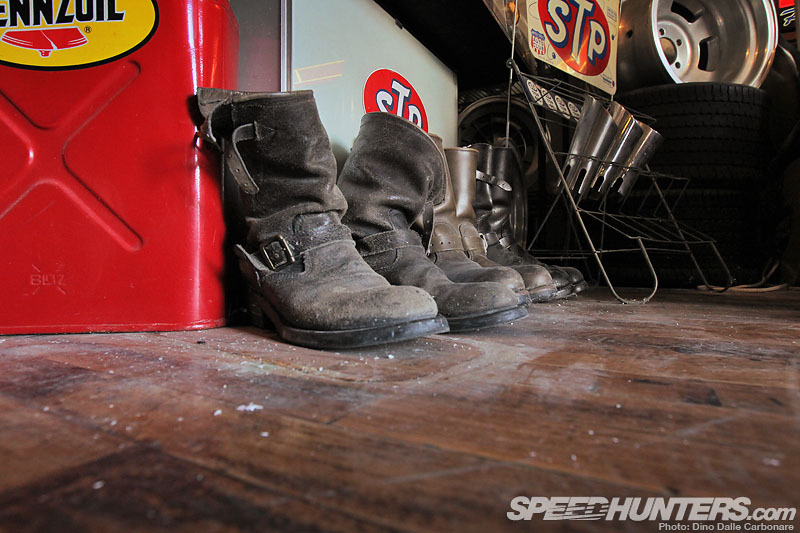 The best way I can describe it, is sort of like a lair, or a mancave, where the decor is a direct reflection of its owner’s mind. 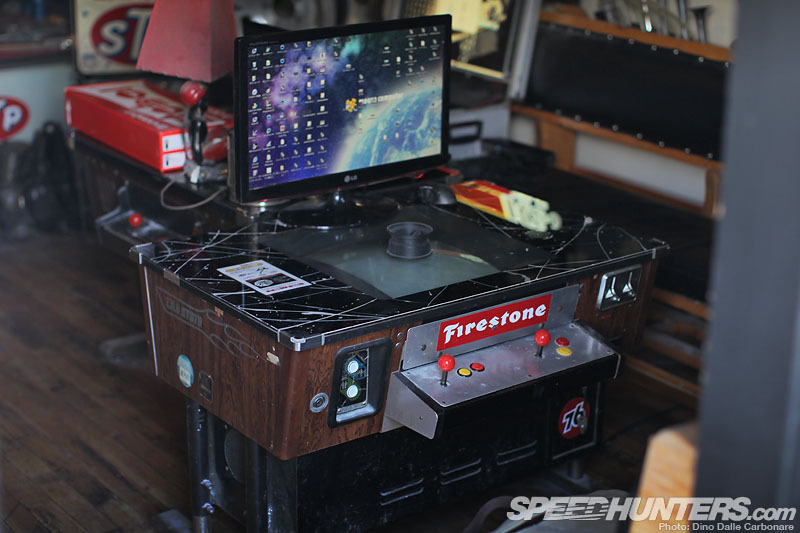 … to vintage arcade video games, all stuffed into a pretty small space. 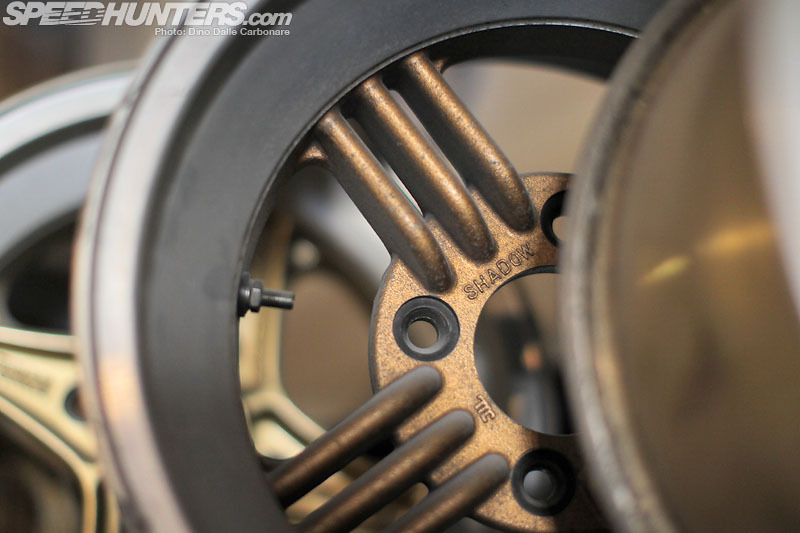 Much like Nakai-san at RWB, Miura likes to have objects that inspire him all around. I guess great minds think alike. 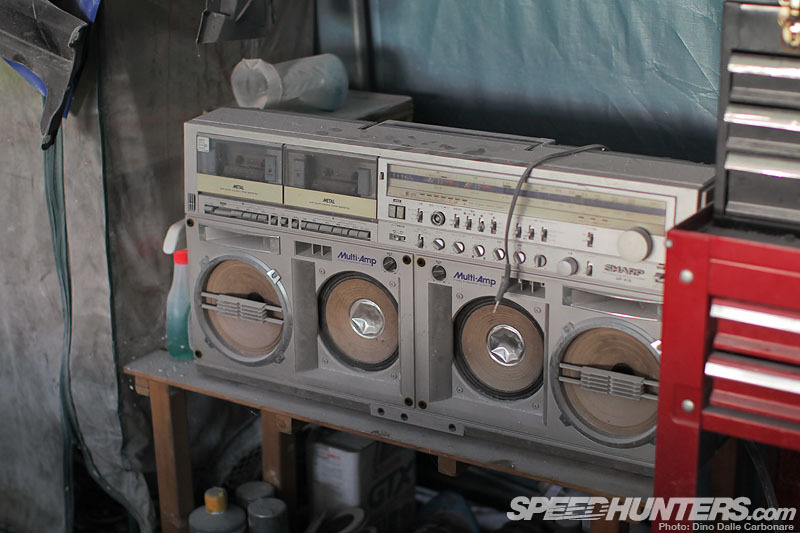 … along with stacks of miscellaneous items. 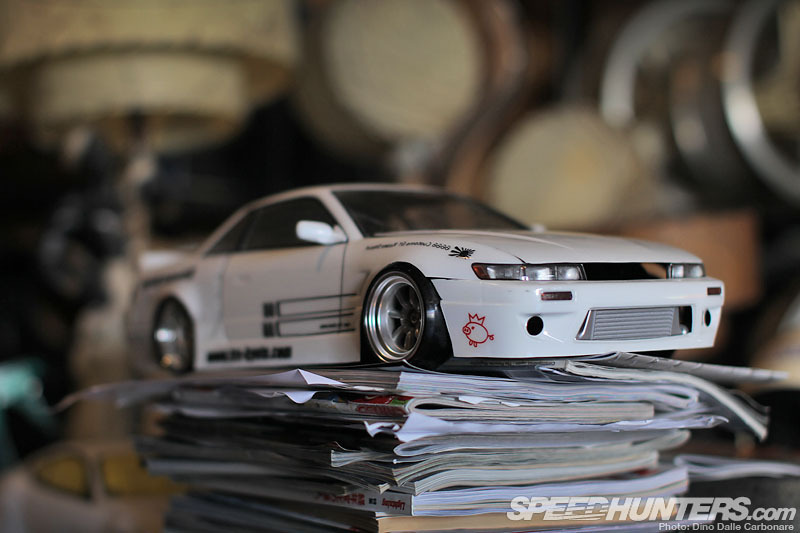 Check out this 6666 Customs-bodied S13 R/C drift car! 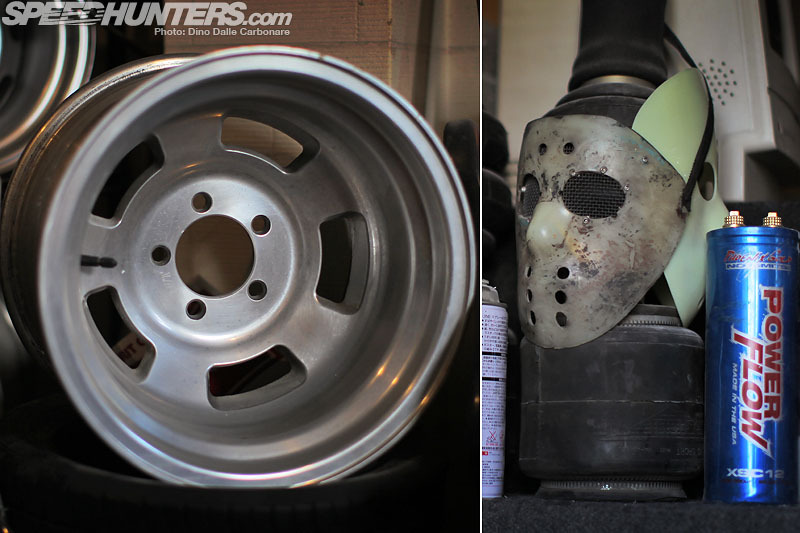 I even spotted a few Friday the 13th ‘Jason’ masks from his old Kanjo racing days. … I even spotted a boxed one! 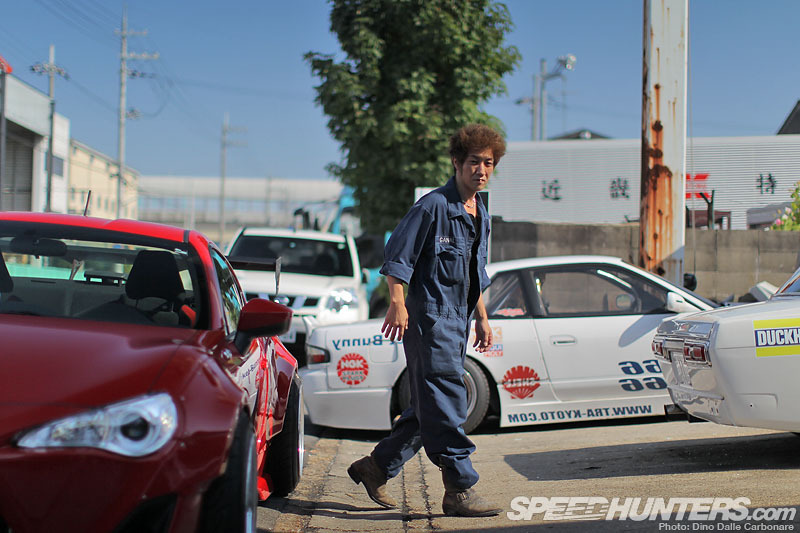 And it’s from then on, after talking more with Miura, that you really begin to realize what kind of place TRA Kyoto really is, and the reason why it has received so many accolades in the JDM world. 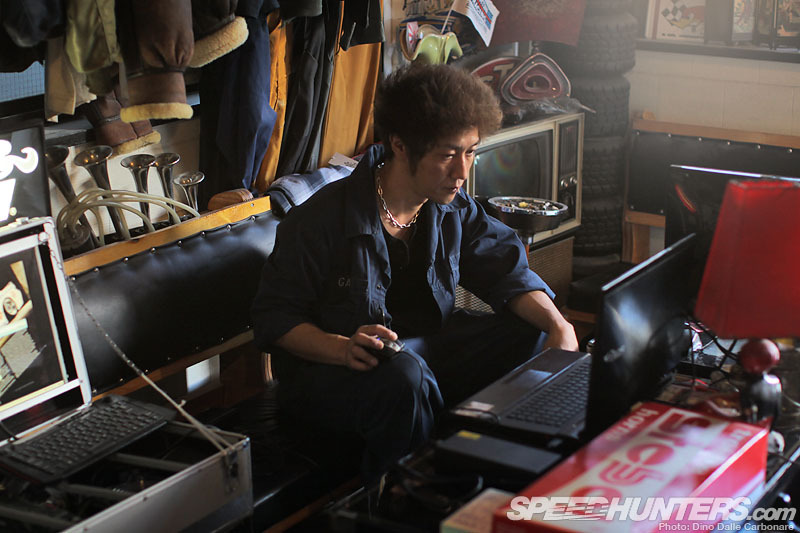 What makes Miura stand out is the fact that he is a bit of a computer genius. 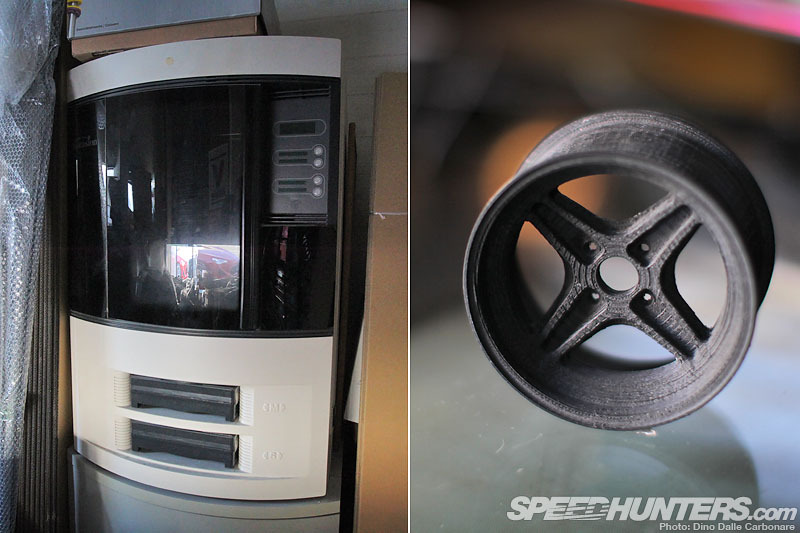 Along with a few friends at Kyoto University he has developed his own hardware and software that allows him to quickly and accurately laser scan cars and create 3D digital renderings on his powerful mobile CAD workstation. 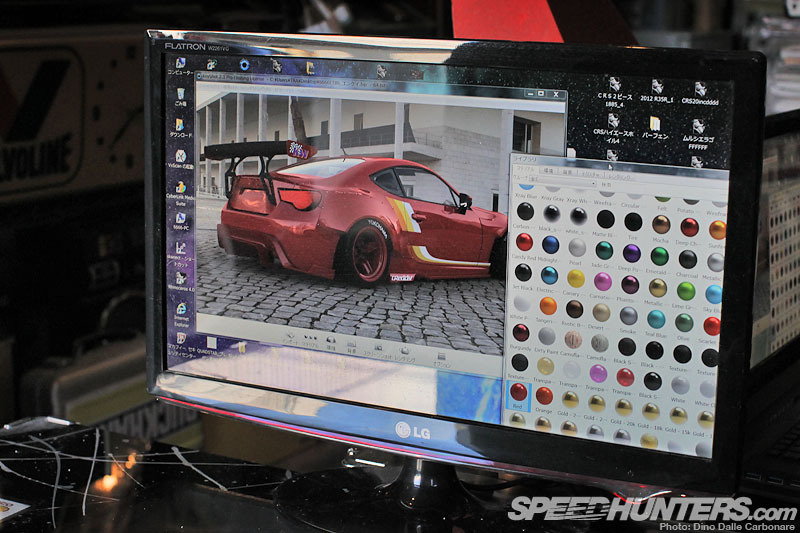 From there Miura designs and models the cars in CG, developing his own kits. I got a quick demo to see just how quickly and easily he can visualize his finished cars in Rhino. 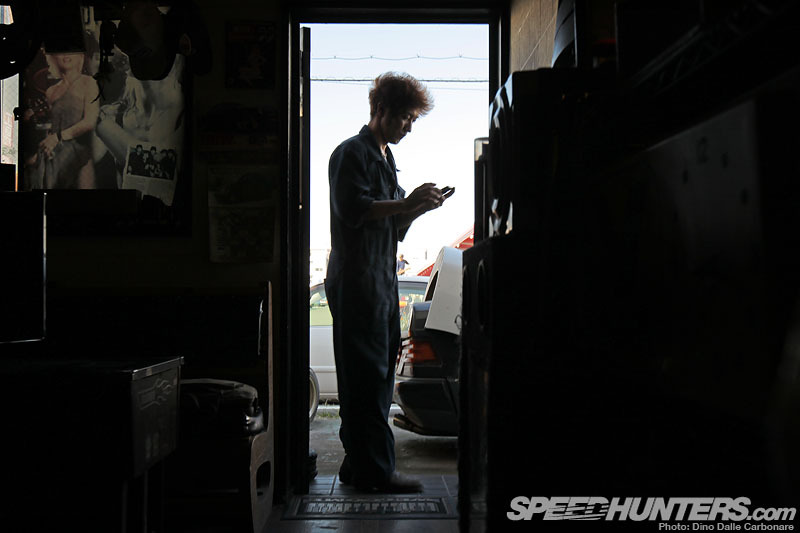 I can’t show you exactly how he scans the cars, but I assure you – my mind was blown! 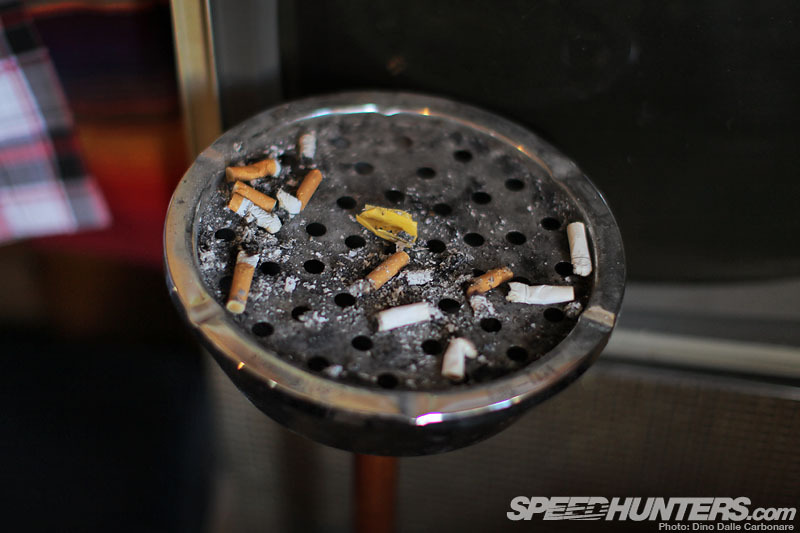 And yes, cigarettes are never too far away. But how does Miura manage to turn those 3D renders into reality I hear you ask. Well for this you need to follow me to the back of the shop where the real mind-blowing stuff happens. 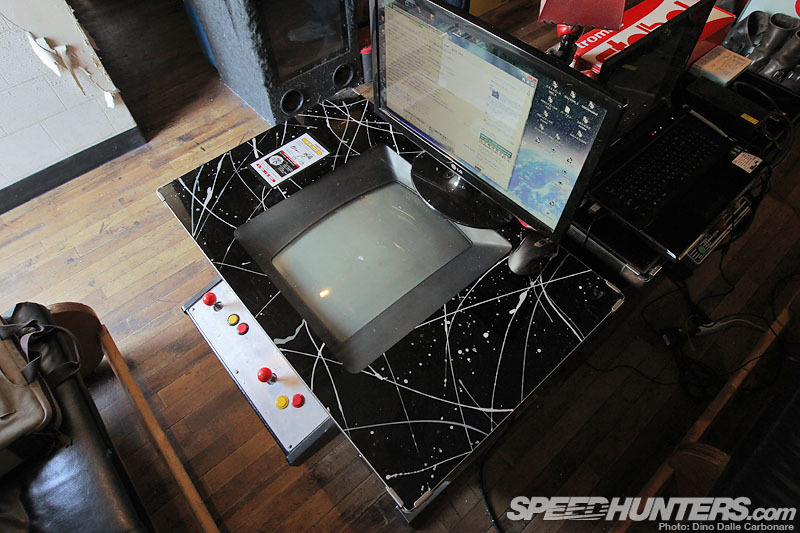 This is Miura’s special room – the place that has allowed him to not only get his name out there, but to stay at the top of the game for so many years. 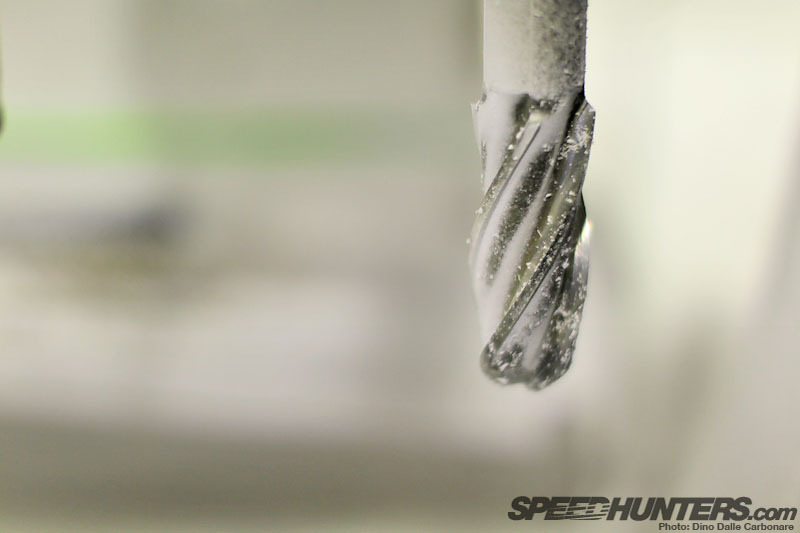 While almost all Japanese aero makers still design their parts by hand through clay modelling, Miura is able to rapid prototype full-scale parts in a matter of days. 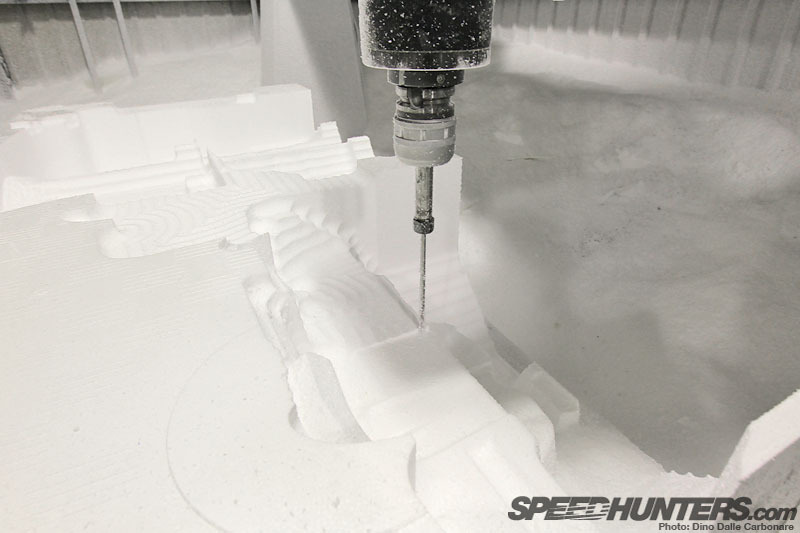 After the designs are completed, he feeds the data onto this CNC machine which sculpts the negatives of the mould onto those blocks of polystyrene that we saw outside the front of the shop earlier on. 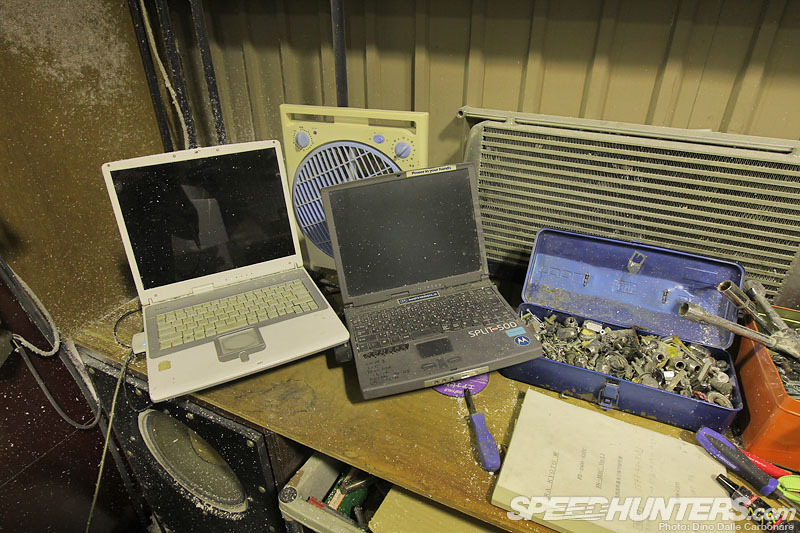 Everywhere you look there seems to be computers. … of where the cutter is at any given second. 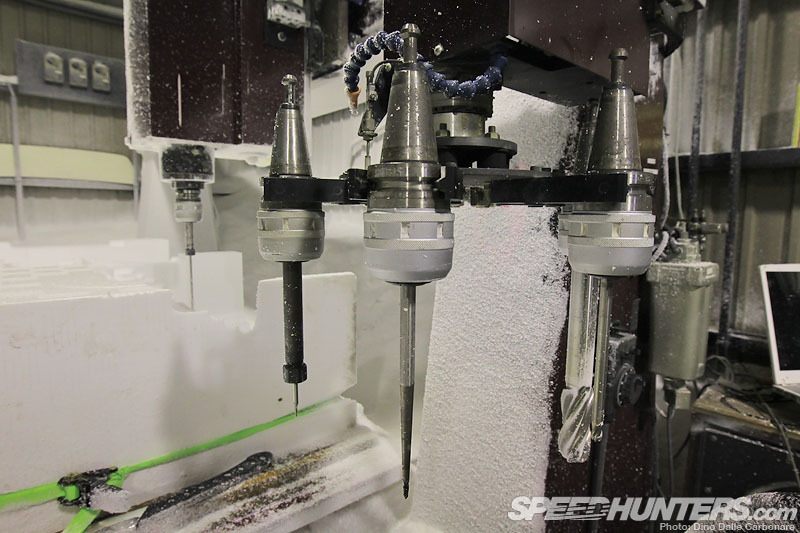 … automatically changing the tip when needed to finish up and smooth out the surfaces and curves. Which is why it looks there’s a snowstorm happening most of the time! 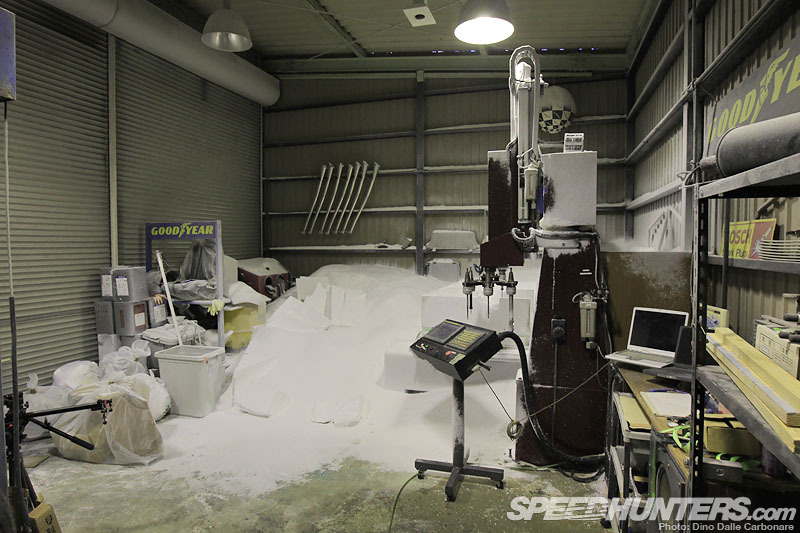 From there Miura creates the moulds from which his FRP parts will be made from. 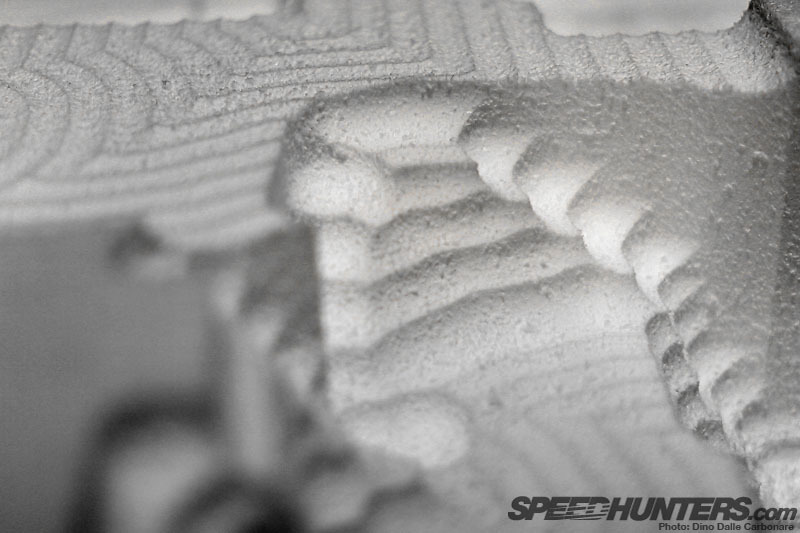 It takes him about a month to go from the 3D scan of a car, to design, to mould creation and then finished product. 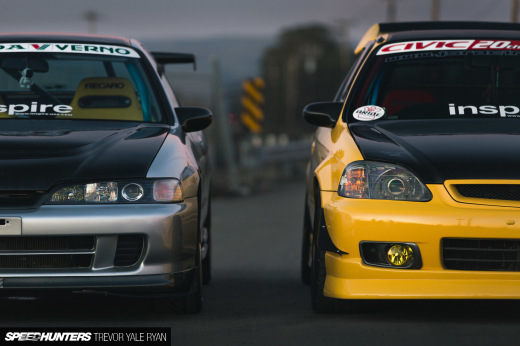 His speed alone has made TRA Kyoto the place to go to for Japanese tuners and parts makers to get their own aero parts produced. It’s also the reason Miura is one of the busiest people I have ever met. His list of clients is impressive to say the least. To top it off, the nature of his method results in parts with perfect form and symmetry that fit right. 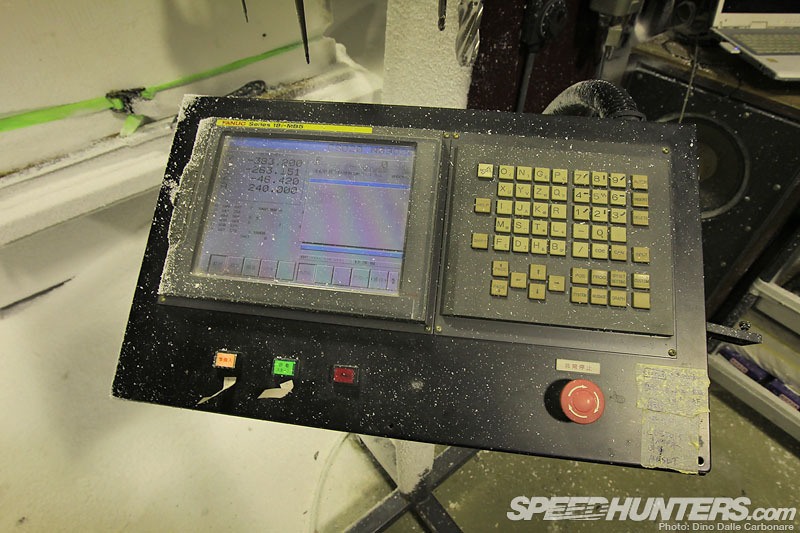 Years ago Miura took a big step by investing in a system that nobody had every tried at this particular level – a decision that has allowed his style to flourish, and bring much needed quality and speed to the aftermarket industry. And this is really only the beginning for TRA Kyoto, as I’m sure we will be seeing a lot more trend-setting designs from Miura for years to come. 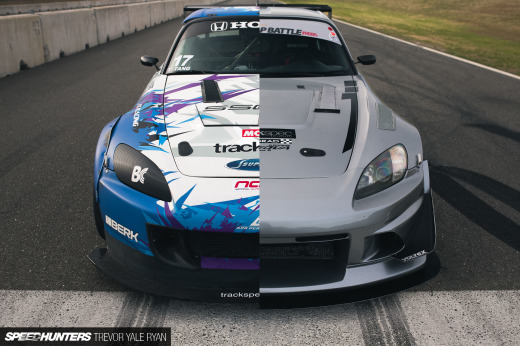 "Since TRA-Kyoto get most of the credit, it’s hard to remember that this now-legendary body kit is actually a collaboration between GReddy and Rocket Bunny, and one that is actually sold under the GReddy namesake." Also, couldn't you just order the kit from Japan and ship it to North America? 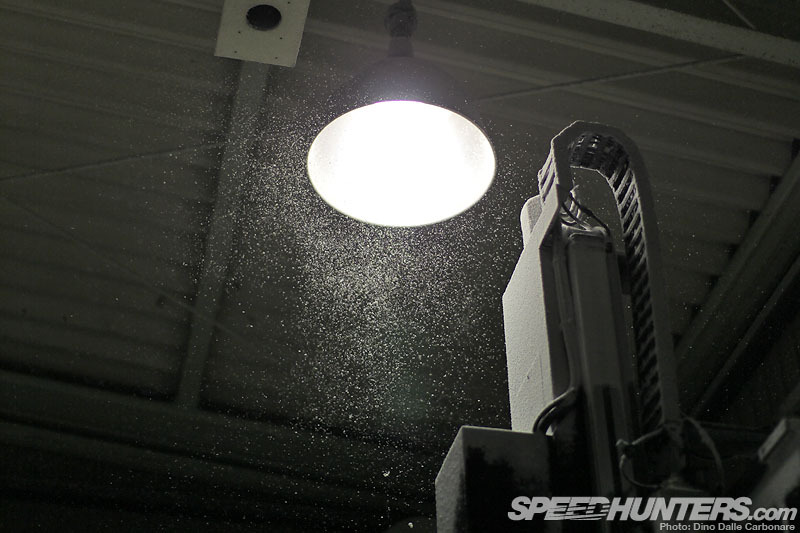 What is the significance of Greddy having exclusive North American distribution rights? It has to do with copyright and all the other law stuff I believe. Probably not if you live in America because since (most likely) Greddy has "exclusive" North Amer. distribution rights, they are the sole people that take care of the marketing, sales, and distribution to customers so that TRA doesn't have to. I'm sure they have a contract between one another that states something similar. Also, if you can get it from the USA, shipping is cheaper and you pay no tariffs, win-win. Im in kyoto, i need to know where the garage is located please . I disagree that injecting things with your style is the most difficult aspect. Can somebody help me out? This is the story, I am from South Africa and I have the first Toyota GT 86 sample that was manufactured with the new spec kit. I was the first to install the rocket bunny kit and the first to install a 2JZ 3 LITRE VVTI engine. 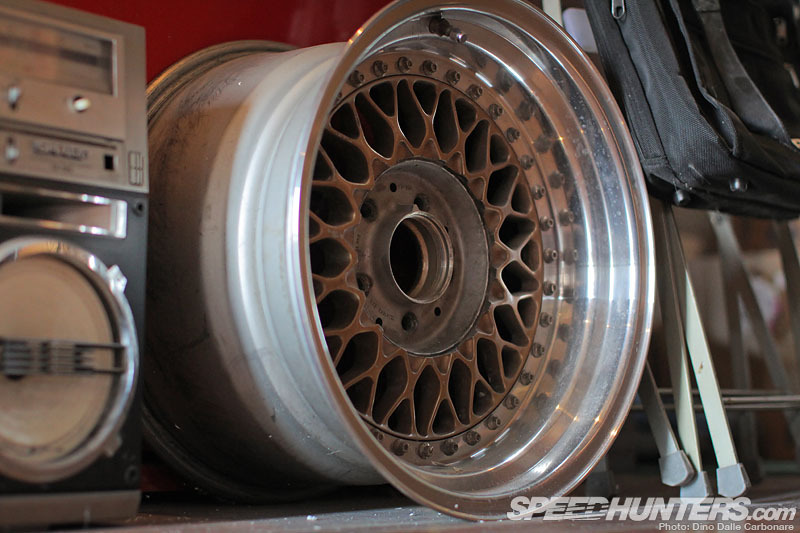 I just can not find a set of rims that are wide enough to fit on my car hence I have 2 inches spacers. The car looks amazing but the problem is that the studs will break of the spacers. 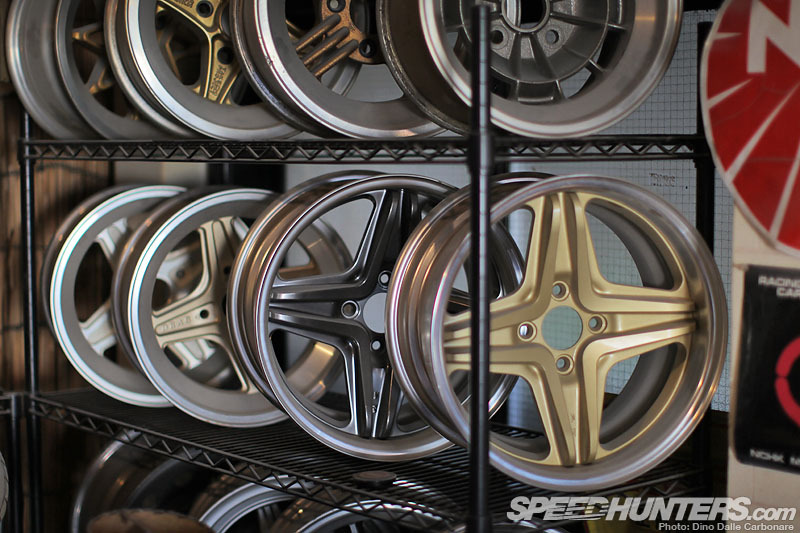 Can someone hook me up with a set of rims that are wide enough. My email is .co.za. . All your help will be much appreciated. Hi, can you do a rocket bunny kit for a 2010 MB E63. ?